Quiche lorraine was originally an open pie with a filling of custard with smoked bacon or lardons. *It was only later that cheese was added to the quiche lorraine. The addition of Gruyère cheese makes a quiche au gruyère or a quiche vosgienne. The ‘quiche alsacienne’ is similar to the ‘quiche lorraine’, though onions are added to the recipe. The bottom crust was originally made from bread dough,but that has since evolved into a short-crust or puff pastry crust that is often baked using a springform pan. Today, one can find many varieties of quiche, from the original quiche lorraine, to ones with broccoli, mushrooms, ham and/or seafood (primarily shellfish). 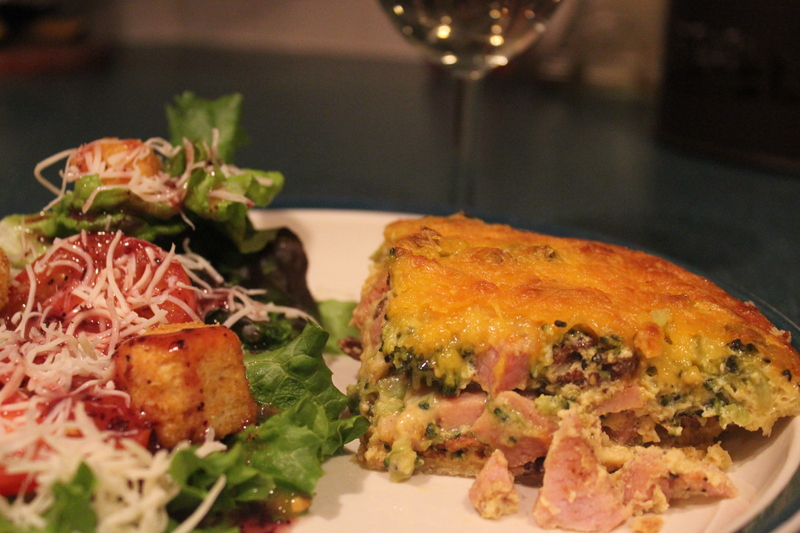 Quiche can be served as an entrée, for lunch, breakfast or an evening snack. The origin of quiche lorraine is rural and the original quiche lorraine had a rustic style: it was cooked in a cast-iron pan and the pastry edges were not crimped. Today, quiche lorraine is served throughout France and has a modern look with a crimped pastry crust. The current version of quiche lorraine served in France does not include cheese. Unlike the version served in the United States, the bacon is cubed, no onions are added and the custard base is thick. As we all know we can make this any way we want, adding what we want. I made mine with bacon, ham and broccoli. It was wonderful the first and second time around. I made enough for two deep dish quiches. The recipe calls for the making of one, just double if need be. Bake the pie crust at 350 for 9 minutes remove but keep the oven on. Soften the broccoli by steaming for 15 minutes. Cook the bacon and when almost finished add the garlic. Whisk together all of the eggs, milk, salt and pepper in a large bowl. Throw together the ham and bacon, layer on the bottom the pie pan, top with broccoli and add the egg mixture to about ¾ full. Bake for 25 to 30 minutes until the egg is firm.